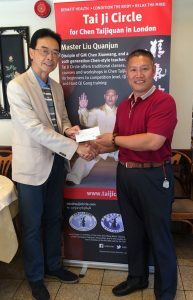 Shifu Liu presents Mr. Chen Deliang of the Chinese in Britain Forum with a cheque, monies raised from the TJC fundraiser earlier in 2018. It is for a memorial to celebrate the Chinese workers who supported the troops during World War One. Mr Deliang is the London Deputy Adjutant of the queen, Britain’s first Chinese mayor and a former mayor of Redbridge.